PT Astra Honda Motor - PT AHM is a leading automotive company in Indonesia with core business focus on motorcycle industry. PT Astra Honda Motor manufactures, distributes and markets Honda motorcycles for the domestic market and export market. PT Astra Honda Motor is as a joint venture company between PT Astra International Tbk with Honda Motor Company Ltd with a shareholding composition of 50% each. PT Astra Honda Motor is recognized as the pioneer in motorcycle industry in Indonesia. According to the Company's profile as cited by JobsCDC.com, the Company was first established in 1971 and initially registered as PT Federal Motor. In 2000, Astra Group restructured its motorcycle business by merging PT Federal Motor and PT Honda Federal into PT Astra Honda Motor. 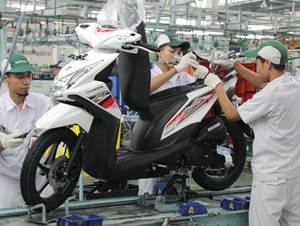 Headquartered in Jakarta, PT Astra Honda Motor now has installed total annual production capacity of 5.8 million units through its 4 production facilities; Sunter Assembly Plant, Cikarang Assembly Plant, Pegangsaan Assembly Plant, Karawang Assembly Plant and Part Centre. The Company also supported by Astra Honda Training Centre Sunter. Background in Bachelor Degree (S1) majoring in Mechanical Engineering with minimum GPA of 3.00 (final year students are welcome to apply). Have a good knowledge about general specifications, design functions and part-making process. Have a good knowledge about the techniques of measuring, testing and motorcycle driving techniques. Have a good knowledge about the designing techniques of fixture. Have a good knowledge about how to analyze the problem of motorcycle components and / or units. Background in Bachelor Degree (S1) majoring in Industrial Engineering, Management with minimum GPA of 3.00 (final year students are welcome to apply). Have strong passion and high curiosity towards motorcycles especially motor sport and big bike. Have good communication skills and easy to get along with others from various fields, positions and age. Familiar with Microsoft Office especially Excel and Power Point. Want to travel out of town for business trip. Background in Bachelor Degree (S1) majoring in Architecture, Interior Design with minimum GPA of 3.00 (final year students are welcome to apply). Operating knowledge of 3D Max, AutoCad, Sketch up, Photoshop. Fluent in English, both oral and written (passive). Diligent, initiative, agile, tough, meticulous. Able to work with team and have soul of customer service (energetic, nimble, and helpful). Able to perform problem analysis by including real data. Background in Bachelor Degree (S1) majoring in Informatics Engineering, Information System, Industrial Engineering with minimum GPA of 3.00 (final year students are welcome to apply). Able to communicate well (oral and written) and have strong interest in activities related to communication, presentation. Eager to learn and able to conduct exploration / research. Background in Bachelor Degree (S1) majoring in Informatics Engineering, Information System with minimum GPA of 3.00 (final year students are welcome to apply). Have a good communication skill. JobsCDC.com now available on android device. Download now on Google Play here. Please be aware of recruitment fraud. The entire stage of this selection process is free of charge. PT Astra Honda Motor - Fresh Graduate Engineer, Analyst Astra Group August 2017 will never ask for fees or upfront payments for any purposes during the recruitment process such as transportation and accommodation.